I recently added the Essentials by Ellen Unicorns 'n Rainbows and Pure Magic stamp sets from Ellen Hutson to my collection, so I had to try them out for her July's Color Trend Challenge. I colored up the unicorn image in shades of pink and purple, then used my Brother Scan 'n Cut to cut out the colored image. It doesn't show in the photo, but I added a subtle sparkle to the unicorn's mane and tail using a glitter brush pen. A unicorn's got to have some sparkle, right? To make a background for the unicorn, I arranged a trio of stitched shimmery white die cut clouds on an aqua card base. The unicorn was positioned on top, using foam tape for dimension. 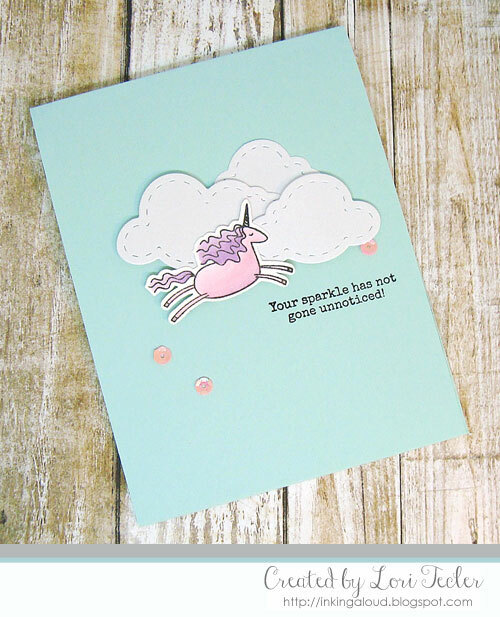 I stamped the "your sparkle has not gone unnoticed" sentiment just beneath the clouds in black ink, then sprinkled a few pink sequins around as an accent to finish the card. Love this sweet CAS card Lori! That sentiment is awesome!